LARP - Live Action Role Play. Accessories for LARP. Made famous by the notorious Uruk-Hai from the epic motion picture trilogy The Lord of the Rings, this wicked looking blade is a menacing and dangerous weapon on any battlefield. Made using a more simple design, it was the strength of the Uruk-Hai that gave this weapon its power. Now, replicated in high-quality latex with a suede wrapped grip, any human can wield this blade and unleash the orc within. The glory of Camelot and the Knights of the Round Table are embodied in this powerful latex blade with a wide crossguard. Good for both single or hand-and-a-half use, it has an antiqued hand-hammered brass colored pommel and crossguard. Built to withstand excessive pounds of stress, it features a suede wrapped, hard rubber handle for good balance and excellent control. Raiders of the English coast could have only hoped for a blade as formidable as this! An antiqued brass finish adorns the cross guard and pommel. This realistic latex weapon features a suede wrapped, hard rubber handle for good balance and excellent control. From our Warlords collection, this one handed long latex sword has an ebony blade. It is perfect for Prince and wandering Ranger alike. Features a suede wrapped, hard rubber handle for good balance and excellent control. This realistic latex knife is a perfect companion for just about any of our LARP blades. It is as beautiful as it is deadly. Great for that up-close encounter. Features a suede wrapped, hard rubber handle for good balance and excellent control. A true beast of a sword. This two-handed latex warsword is ideal for clearing the battlefield in short order. Features a suede wrapped, hard rubber handle for good balance control and police grade Kevlar for a non-tearing thrust. From the Age of Conan Hyborian Adventures game comes this one handed sword capable of slicing its way through any Hyborian Kingdom. Features an antiqued brass hilt and diamond shaped blade with a dual serration edge. Features a suede wrapped, hard rubber handle for good balance and excellent control. 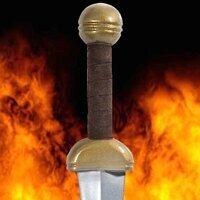 From the Age of Conan Hyborian Adventures game comes this elegant sword with an antiqued brass hilt. The blade has a dual serration edge. Features a suede wrapped, hard rubber handle for good balance and excellent control. From the Age of Conan Hyborian Adventures game comes this longsword highly decorated with Acheron runes. The blade features a fierce slicing tip. The handle is shaped and suede wrapped hard rubber for good balance and excellent control. From the Age of Conan Hyborian Adventures game comes this wicked blade with a scythe type edge. Acheron runes adorn the blade. Features a shaped, suede wrapped, hard rubber handle for good balance and excellent control. From the Age of Conan Hyborian Adventures game comes this Aquilonian sword decorated with brass fixtures. Suitable for a Centurian. The handle is suede wrapped hard rubber for good balance and excellent control. From the Age of Conan Hyborian Adventures game comes this sword with a chiseled tip and Cimmerian runes on both the hilt and blade tip. Features a suede wrapped, shaped hard rubber handle for good balance and excellent control.